Healthcare leaders trust us to develop critical eMarketing, 3D Animation, and eLearning systems for their physicians, salespeople, and patients. We believe that our competitive edge is that we share our clients' passion for medical technologies, and comprehend the medical science and marketplace. By blending our advanced visual technologies with solid instructional design, the 3D animations and eLearning or eMarketing content we produce are a compelling and effective extension of your brand. Let our 3d design team work with your internal experts to develop successful interactive medical simulations, animations, video, and training; on time, on budget. To learn more about Interact Medical, click here. 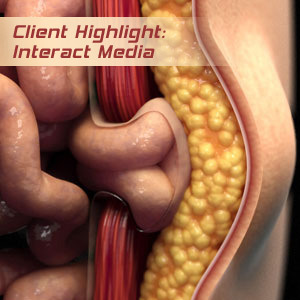 "Interact Medical has relied on Zygote's Male Anatomy for a number of our 3D animation projects over the past decade. Additionally, many of our interactive projects have utilized both the male and female anatomies, including high profile projects for the biggest names in the medical device market like Baxter, Medtronic, DePuy, GE Healthcare and Ethicon. Also, even non-anatomical custom modeling assignments we have done for biotech 3D animations have used assets from Zygote as backgrounds and transition segments. We are excited to begin using the new 5.0 upgrades from Zygote in upcoming projects, and consider Zygote to be the best resource for 3D anatomical libraries".